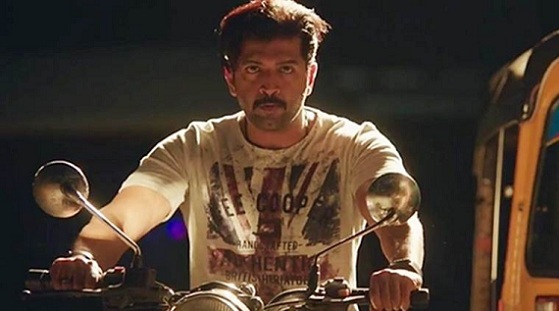 In Thadam, writer-director Magizh Thirumeni puts a new spin on one of the oldest masala-cinema tropes: the double role. Whether with Sivaji Ganesan (Uthamaputhiran) or MGR (Ninaithathai Mudippavan) or Rajinikanth (Billa) or Kamal Haasan (Aalavandhan), the twin performances have hinged on a difference: one is good, the other is evil. Also, sometimes, one is rich, the other is poor. There’s definitely an economic disparity between the two characters Arun Vijay plays here, Ezhil and Kavin. The former drives a BMW. The latter robs ATMs with his sidekick Suruli (Yogi Babu, once again mocked for his unconventional looks and made to do “I am B.Com. Literature”-type comedy). But there’s no good/evil demarcation. Neither Kavin nor Ezhil is exactly a moral person, but they’re both treated sympathetically, painted in “circumstances made me this way” shades. The film takes a while to get going. Owing to the focused second half, a lot of the romance — between Ezhil and Deepika (Tanya Hope) — is packed into the early portions. (Deepika seems to be a film critic. Her line about quitting her job because she’s tired of reviewing six films a week made me smile wistfully.) But as we slowly discover, this isn’t just throwing the audience a duet because “they demand it and we need a song for the promos”. What looks like a minor romantic track turns out to be the crux of the narrative, which really gets going after a murder. In the usual “twins story”, one of the two would have committed the crime, and the other one would end up the suspect, being chased by the police. But what are the odds that Kavin and Ezhil end up suspects! The premise is pulp pleasure. Surprising to see no comments here. This is a solid whodunit thriller which plays out more like an investigation drama. The biggest working factor for this movie is its focus, which was the hallmark of the director Magizh Thirumeni’s earlier movie Thadayara Thakka as well, another pulpy whodunit with more grit. I also like the way the director handles the romance portions in both the movies – casual and real with some banter thrown in. He’s grown significantly from his first movie Mundinam Partheney, which had a lot of thalakeezha thooki potu thirupum kaadhal moments and other bad habits inherited from his mentor GVM (the movie was quite enjoyable nevertheless). One of the clues the director plants is too expository that I actually guessed the killer and his motive right there. But then the screenplay makes sure your biases keep shifting, hugely aided by Arun Vijay’s grey-ish restrained act with both his characters. The final twist in the climax (after the big reveal) did not seem convincing, though I still liked it because of its roots in the classic masalaverse. I will stop with this now that I don’t end up spoiling it for those who haven’t seen it yet. Aadhy – I second your comment. The movie is picking up steadily though it was completely overshadowed by 90ml on its release day. It was a houseful noon show today – a Monday – even with the public exams underway! Even I expected the twist, or atleast it was one of the 3-4 probable endings that I had in mind and there lies the Director’s success – that it was always a toss up among different possibilities. The theater erupted at the final reveal but the unnecessary song placement after that did kill the mood. But a pulpy one overall. Magil thirumeni is one director I avidly keep a tab of. His last film with Arya was an under-appreciated gem, imo. And this film too didn’t disappoint at all. A few flaws that brought down the impact – too many things were happening in the first half with little time for the scenes to breathe or for us to take them in. And the flashback that should have been the emotional fulcrum of the movie falls short due to some bad acting. If the guilt-redemption angle in Kavin’s relationship with his mother and the thing he does for his brother to redeem himself, had been brought out well, this movie could have packed quite an emotional punch, I felt. Waiting to watch what this director does next. I fourth it, quite a decent thriller. Maybe Arun Vijay’s best work till date. It’s a solid thriller! A very good one. Like others here, I am surprised with such low comments here. Well, maybe there is not much to argue here for many of us! I haven’t seen Vijay’s Kathi…was his double role in the movie in any way as good? I have seen mersal and can’t say whether his performance was good as I suffered brain damage from watching it. Managed to see the movie only yesterday. I really enjoyed it(Whodunnits are my favourite genre, be it a novel or a movie!). I just found one major weak link in the story, which, though it didn’t spoil the movie experience for me, kept nagging me a lot! I mean the scene where the police show Ezhil the selfie evidence, and Ezhil does not accuse his twin of the crime. This point comes again during the big reveal. Initially, when the selfie is shown to Ezhil, it is understandable that Ezhil’s shocking silence does not seem unduly strange to the police, since they don’t know he has an identical twin. But after Kavin gets caught(willingly, as we later get to know) and the police find out that they are identical twins, I found it indeed strange that this point was not brought up by anyone in the investigating team. We are only given an explanation(a valid one, no doubt!) for why this crucial reaction of Ezhil did not strike Malar, the investigating officer, later. She confesses to a fellow policeman that she was distracted by Kavin. But what about the rest of the team? We are shown that, unlike in some other movies where the constables and other lower order police are not given much footage, almost everyone in the investigating team are earnest to know who the killer is and are doing all they can to find out. And to top it all, we have Malar’s superior officer(who was present when the selfie was shown to Ezhil, I think) who is hell bent on leaving no stone unturned to find ways of convicting Ezhil, legal or illegal! Why didn’t this most valid point in the case strike an experienced officer like him? Though I am pondering whether to see the film again to make sure I have not missed anything, at this juncture, I think the story falters here big time in what is otherwise mostly a carefully crafted whodunnit! Quite engaging movie. I don’t know if FC gives 2.75 stars. If it does, I think this movie deserves it. Let us say Ezhil was innocent. When he is unexpectedly shown a photo with ‘his face’, he would think that it is most likely that Kavin has committed the murder. Now whether he would mention this immediately to the police depends on 2 things, which the police didn’t know: nature of his relationship with Kavin (he may even want to protect Kavin), (lack of) alibi for Ezhil: He had 2 alibi: Police daughter & Cab driver. When their animosity is revealed, Ezhil also mentions that he had (unintentionally) falsely implicated Kavin recently. Now, the photo is not conclusive evidence to determine that Kavin had committed the murder. So, if Ezhil drags Kavin into this and it turns out that Kavin didn’t commit it, then Ezhil would have further antagonised Kavin. So it plausible that Ezhil doesn’t speak about Kavin until he is convinced that he will get convicted otherwise. Sure, the police could have asked Ezhil about this, but I don’t think this is a ‘how could they have missed it?’ question. For me, the more basic question was: once they see Kavin for the first time, they would have separately asked both of them on whether they have any siblings. This would indicate if anyone was lying and your question about Ezhil’s initial silence would have naturally flowed into that conversation. You don’t wait for a DNA report to realize that they are identical twins. (the movie is silent about this aspect till then). But to be honest, I thought about this question only after walking out of the theatre. And that to me is the hallmark of a good thriller. Isai: The problem in the scene I mentioned and it’s (non)-aftermath all depends on Ezhil’s state of mind at the time of his arrest and immediately after, when he is shown the selfie. Look at the sequence of events for Ezhil. He enquires about his girlfriend’s absence, gets to know that Akash murdered her and in a fit of rage (with a little planning too!) kills him. He burns his clothes immediately after the murder, is careful not to leave fingerprints(though he does leave one, and also his hair, so it’s not a thorough planning! The rage factor holds the upper hand mostly!). He is fairly confident there is no evidence to implicate him and, the rage being sated, he returns to his normal life. Suddenly, out of the blue, he gets arrested and the selfie is thrust in his face by none other than his nemesis in the police force in full view of the investigation team. And the immediate reaction he gives on seeing the selfie is what I am talking about! He does not have the luxury of time to think about his relationship with Kavin or his alibis. He gives the reaction of a person who has been caught unawares! Such reactions mostly tell the truth. There are only two reactions possible based on whether he committed the murder or not. If he didn’t, his reaction would be one of confusion, and he may or may not have blurted out Kavin’s name in his confused state of mind. If he did, then the reaction is exactly the one Arun Vijay so splendidly gives in the film as Ezhil. It is plain shock and guilt that is written on his face. There is not even an iota of confusion! Remember, he is not a trained killer or anything. Sure, he had a bad past(not so much as Kavin, still!). But he is not some hardened criminal to give a fake reaction in such a situation! And the police team (especially the one who has it in for Ezhil) does note this at that time. But since they don’t have the burden of two look-alike suspects then, they would just have taken it as an additional confirmation to the incriminating evidence. But after Kavin’s entry and after they come to know they are identical twins, I would expect someone in the team, at least Ezhil’s nemesis, to have brought up this point! They do come close! One of them asks Malar why Ezhil would try to escape if he did not commit the murder! If that, then why not this more important question about his initial reaction when they are breaking their heads over who is the guilty twin? It is not so much why he did not implicate Kavin as why his reaction was one of plain guilt! A proper answer is given in the screenplay only for Malar, which, IMO, is not enough at all! I also agree with your point about how the questioning should have gone, but I think the issue I mentioned is a more serious one, since a lot happens in the twins’ favour due to the absence of that question and a lack of proper explanation for that absence, especially Ezhil’s nemesis going for illegal ways to implicate Ezhil, followed by Malar doing the same thing to save Ezhil, resulting in Malar not being able to reopen the case even after realising the truth. I would have been satisfied to have either seen the question being raised in SOME conversation, or a decent enough explanation for it’s absence. A cat-and-mouse game is much more interesting when both the cat and the mouse have competing strengths. Here, this flaw in the story turns the tables a bit too much for comfort the twins’ way! For comparison, Sathru, the film I saw yesterday, does this balancing beautifully, as BR has also noted in his review. Ezhil not blaming Kavin is perfectly acceptable, given what they say in the ending. That, regardless of all the fighting beween the identical twins, they shall unite at the end of it all – the Dr. still doesn’t know, who stabbed him with a fork – Kavin or Ezhil! So Kavin is not the only one having the soft corner for Ezhil, it works the other way too. And so, the ending clearly justifies why Ezhil didn’t put the blame on Kavin. Isn’t this enough? What do you say? I see no loophole here! jaga_jaga: Maybe you read only my first comment. I have explained the problem clearly in my previous comment as a reply to Isai. The issue is not primarily whether Ezhil would blame Kavin or not. As you say, it is clear that he would only try to save Kavin since they bond together in the face of problems, given sufficient time. I am not concerned about that at all. It’s the instant reaction that Ezhil gives on seeing the selfie that really matters, but I feel it was not given due attention in the story. Otherwise, as I have mentioned before, it is mostly a clean whodunnit with some minor flaws. To avoid repeating myself, I would refer you to my previous comment. If you find any reason for not buying my explanation there, do let me know, and we can discuss. Indeed I read only your first comment earlier. Now I’ve read the second comment too. For me, I felt that the expression Ezhil gave when arrested by the police was perfectly legit. A confused look with an air of confidence and arrogance that he can beat the system. He committed the murder overcome by emotions. But he is more than smart enough to realize that the police might come for him (his academic pedigree, smarts in business etc etc point out to it). So, I was perfectly OK with his expression at that point, and don’t see it as a downer. Only problem for me was how no one suspected Akash (the one whom Ezhil killed) when folks clearly saw Ezhil’s lover with him last. But even that is not a major issue for me, because of what the heroine’s friend said – that no one really cared about the heroine. Mom in US, dad not with her etc etc. Overall, I see no loophole in the narrative. The pathos part of it (involving Sonia Agarwal) was plain brilliant. What happens to geniuses born in dysfunctional families is excellently portrayed. Jaga_jaga: I don’t mean the expression Ezhil gives when he is arrested. Of course he is smart. But he never expected the selfie evidence, and the expression he gives when he is shown it is what I am talking about! It’s not at all a confused look! It’s just plain guilt and shock! Malar remembers this much later, and we are shown the scene again, if I remember right. So, that is the problem I am talking about.